Meet the innovative chefs spearheading New Zealand’s kai revolution by incorporating Māori tradition and unique indigenous foods into their menus. New Zealand cuisine is well celebrated in the hundreds of excellent restaurants and cafés found throughout the country. Recently, the influence of Māori tradition and indigenous kai (food) have been recognised as nationally recognised taonga (treasures), providing a point of difference that innovative cooks and chefs are proud to incorporate in their menus. Two years ago, innovative young chef Monique Fiso returned from New York City’s Michelin-starred The Musket Room to create Hiakai (hungry). This is a pop-up series of events, local and international, dedicated to the development of Māori cooking techniques and ingredients. Fiso’s Māori and Samoan ancestors were great innovators of food and land, developing their own style of earth cookery (hāngi) and successfully adapting the indigenous flora and fauna for their meals. 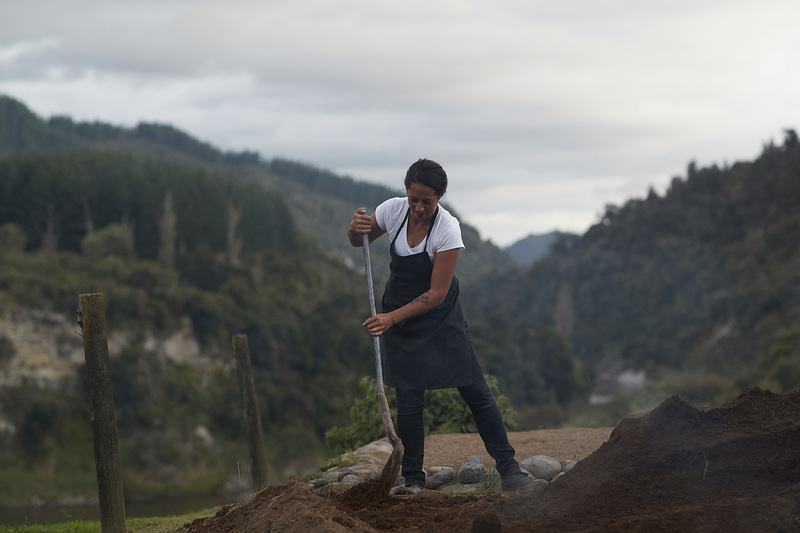 She leads the way in modernising these traditional foods with her exquisite fine-dining cuisine and is at the forefront of the Māori food revolution. Jeremy Rameka’s colourful Pacifica, on the Napier waterfront, was named Cuisine magazine’s 2017 New Zealand Restaurant of the Year, a well-deserved prize for this shy and talented Māori chef. His sophisticated menu of stylish modern dishes is inspired by memories of family meals he ate growing up in Kakahi near Taumarunui. Rameka works wonders with the beautiful kaimoana (seafood) sourced from the eastern coast and beaches of Hawke’s Bay. His favourite ingredients are kutai, the green-lipped mussel native to New Zealand’s coast, kumara (New Zealand sweet potato) and native bush ingredients, and if you’re lucky you may find kina (sea urchin) and paua (abalone) on his ever-changing five-course seafood menu. One of the first chefs to bring his culinary heritage to the New Zealand table was Rex Morgan, an expert in French cooking techniques who adapted his style to include his personal experience of Māori influence and ingredients. He has been a hero chef on Māori Television, introduced indigenous ingredients to Air New Zealand’s business-class menus and is now the executive chef at Wellington’s popular Boulcott Street Bistro. Morgan adds the earthy, smoky flavours of traditional hāngi, and the native herbs horopito and kawakawa to some of the restaurant dishes. He will cook a menu with Māori influences by request. Christchurch’s Kākano Café and Cookery School is the pioneering business of Jade Temepara, a busy mother of five. Temepara brings the traditional concept of manaakitanga (hospitality) to her eatery, holding firm beliefs that kai can heal and bring both whanau (family) and the community together. Through her menu and occasional cooking classes, she emphasises foraged, free-range, fresh and 100 per cent nutrient-dense, organic, spray-free and focused food. The café, recently relocated to a sunny spot in the central city, is a happy and welcoming place with tasty, nutritious fare. Massey University has currently two marae (traditional Māori meeting grounds) under construction – in Wellington and at the main Turitea campus in Palmerston North. The university’s executive chef, Sean Kereama, will preside over the two new kitchens of these marae in addition to his current work at Wharerata, a beautiful turn-of-the-century homestead in the Turitea grounds, where there is a café catering to students, staff and visitors. Kereama, who has mastered a wide spectrum of international cuisines, is from a Māori/Malay Chinese background. And he’s not the only successful chef in his family – his brother, Jude, runs two restaurants in Cornwall, England, specialising in Māori-influenced fare. New Zealand wine dinners, matched to Kereama’s menu, are a specialty of the Wharerata calendar and open to all food and wine connoisseurs. New Zealand Māori are a proud race, entwined with Pacific Polynesian peoples by history, culture and language similarities. Robert Oliver’s Kai Pasifika, in the Auckland inner-city suburb of Mount Eden, celebrates these bonds and the unique cuisine of the Pacific people. The restaurant holds special dinners focusing on specific island cuisines, including that of the Māori, and well-known cooks and celebrities are often invited into the kitchen. The food is vibrant, island-style fare with ingredients sourced locally and from the Pacific Islands – a clever concept in a city with the largest Pacific Island population in the world. Kai Pasifika’s wine list concentrates, uniquely in New Zealand, on only wines made by Māori-owned companies such as Tohu and Otu.